In this new version, two great features have been added. One is for everyday users, the other for users who get lots of notifications. 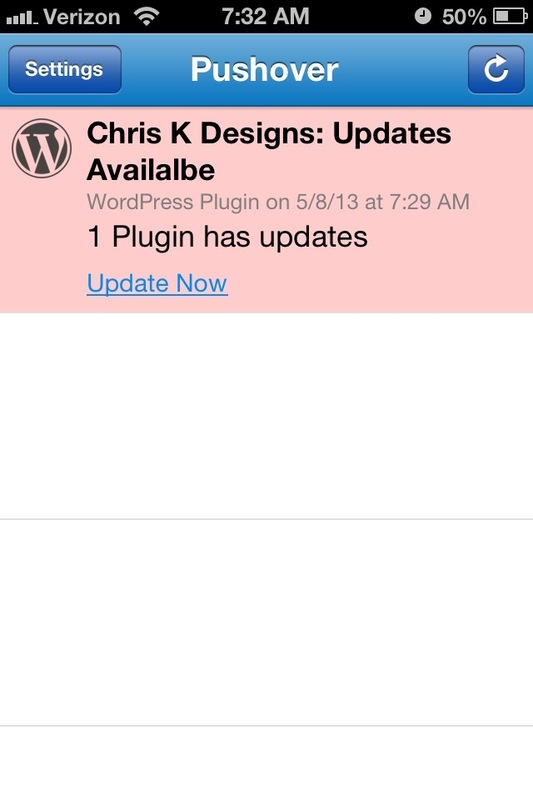 The first is Plugin and Theme Update Notifications . Twice a day, Pushover Notifications for WordPress will check for updates to plugins and themes, and let you know if there are any available. A link is also included to the admin page to update, and after logging you can quickly update your WordPress plugins and themes. The second feature is more advanced and is helpful for sites that send many notifications, Multiple Application Keys. If your site is nearing the total monthly limit of push notifications you can send with your primary application key, using multiple application keys can help distribute this usage. You can also use this to have different Pushover Application icons for different notification types. Once enabled you’ll have access to the ‘Additional Keys’ tab, where you can manage the application keys you want WordPress to use. Giving them a name and supplying the key is all that’s necessary. The name is arbitrary and only used by WordPress to help you better identify which key you are using when selecting which notification should use which key. Before adding a new key to the list, you must first Create the key with Pushover.net, by clicking on the ‘Create a New Application’ button. Once you’ve added some keys to the list, you can then setup notifications to use them. Your Default Key does not need to be added to this list. It will be used automatically. The changes were just pushed and should show up shortly. Here’s the full change-log for the 1.8 release and as always, provide any feedback in the support forums on WordPress.org! 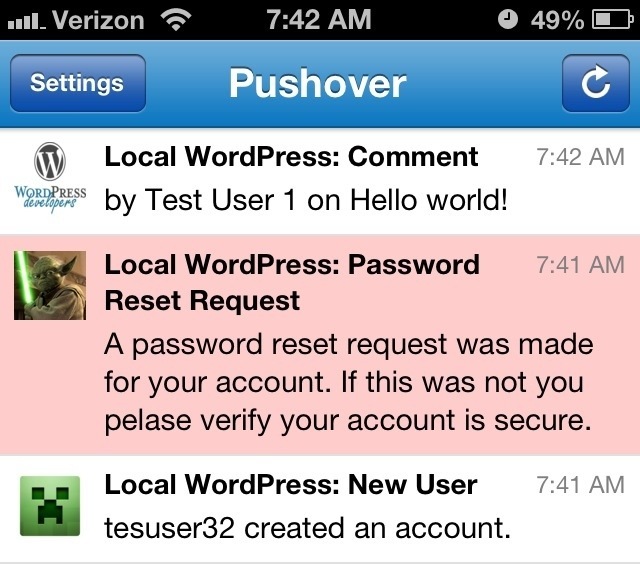 NEW: Pushover Notification when plugin or theme updates are available. Checks every 12 hours. NEW: Allow multiple Applications keys. Useful for sites that send large amounts of notifications or want to use different application icons for different types of notifications.